The footballer Andrea Pirlo, who some commentators bracket with Roberto Baggio as one of the two best Italian footballers of the last 25 years, was born on this day in 1979. The 38-year-old midfielder, who currently plays for the Major League Soccer team New York City, has played in six Italian championship-winning teams and is a double winner of the Champions League among a host of honours as a club player. In international football he has a World Cup winner’s medal as a member of the 2006 Italian national team that lifted the trophy in Germany. The fulcrum of the Azzurri midfield, he scored one goal and was credited with the assist for three other goals during the tournament. One of those assists resulted in the crucial opening goal for Italy scored by Fabio Grosso in the classic semi-final against the host nation. He was also one on Italy’s successful penalty takers during the shoot-out that decided the final against France. He was named man of the match three times in the tournament, more than any other player. He matched that achievement six years later at Euro 2012, when Italy were beaten in the final. In all he won 119 caps for his country, the fourth highest total of all Italian internationals. Fellow players nicknamed him l’architetto – the architect – for his ability to design and construct attacking moves. Although he began his career as an attacking midfielder or sometimes even a second striker, Pirlo excelled as a deep-lying central midfielder, a playmaker with wonderful vision and the ability to hit accurate passes over any distance. He also acquired renown as a free kick specialist, capable of curling the ball into the net beyond the reach of the goalkeeper. He claims he honed his technique by watching Baggio train at Brescia, the club at which Baggio wound down his career and Pirlo began his. Pirlo was born in Flero, Italy, in the province of Brescia and began his career with the Flero youth side. He joined Brescia in 1994 and made his debut in Serie A in May the following year at the age of 16, although it took him a further 18 months to win consistent selection for the senior side. When he did, Brescia won the Serie B title and with it promotion to Serie A in 1998. It won him a move to Internazionale of Milan but could not break into the first team permanently and was loaned to Reggina for the 1999-2000 season and then back to Brescia in 2000-01, where he played alongside Baggio, his childhood idol. Because Baggio occupied the attacking midfield position for Brescia, manager Carlo Mazzone decided to deploy Pirlo in the deep-lying playmaker role that he would make his own. Years later, Pirlo still described the moment he delivered a long pass that enabled Baggio to score against Juventus as one of the high spots of his career. After three seasons on Inter’s books, Pirlo was sold to city rivals AC Milan for 33 billion Italian lire – just over 17 million euro – in June 2001. It was at Milan, in particular under Carlo Ancelotti, where Pirlo at last began to realise his talent and became a world class player. Recalling Mazzone’s use of him at Brescia, Ancelotti decided to position Pirlo just in front of his defence, which allowed him more time on the ball to pull the strings in terms of setting up attacks, where he could use his, anticipation, imagination and inventiveness to best effect. He was a key player in a period of consistent success as Italian football became dominated by Silvio Berlusconi’s AC Milan and MassimoMoratti’s Inter. Milan won two Champions Leagues (2003 and 2007), two UEFA Super Cups (2003 and 2007), two Serie A titles (2004 and 2011), a FIFA Club World Cup (2007), a Supercoppa Italiana (2004), and a Coppa Italia (2003) during Pirlo’s time. Baggio himself sang his praises. “Andrea can visualise and anticipate plays before everyone else. His vision, what he can do with the ball, and what he's able to create, make him a true superstar,” he said. 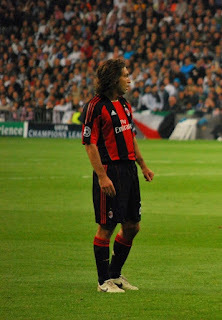 After Ancelotti left to become Chelsea manager in 2009, soon failing with a bid to take Pirlo with him, Pirlo remained with Milan for a further two seasons, winning the scudetto again in 2011, but new coach Massimiliano Allegri used him differently and his final season was restricted to 17 appearances for Serie A, which prompted him to seek a change of direction. But Milan’s loss turned out to be Juventus’s gain after the so-called Old Lady of Italian football, without a trophy since 2003 after two Serie A titles in 2005 and 2006 were stripped from them over the match-fixing scandal, signed him on a free transfer. Under coach Antonio Conte he added three more Serie A titles (2012, 2013, 2014), as well as two more Supercoppa Italiana titles (2012 and 2013). When Conte left to become national manager, Pirlo again worked with Allegri but more successfully this time, playing his part in a league and cup double in 2015 before leaving for New York. His final appearance was in the Champions League final – his fourth – in which Juventus were beaten 3-1 by Barcelona. One of two children – he has a brother Ivan – Pirlo was married for 13 years to Deborah Roversi, with whom he had two children, Niccolò and daughter Angela. His father founded a metal trading company in Brescia in 1982 called Elg Steel, in which Pirlo has a stake. A wine connoisseur, he also runs his own vineyard. In 2013, his autobiography, Penso Quindi Gioco - I Think, Therefore I Play) – became a bestseller. Flero, where Andrea Pirlo was born, is a town in Lombardy of just under 9,000 residents, situated a few kilometres south of Brescia in the flat plain of the Po Valley, although close enough to the Italian pre-Alps for snow-capped mountains to be visible on clear winter days. Lake Garda and Lake Iseo are a short distance away. Flero itself is a typical northern Italian commuter town, orderly and clean with a couple of churches and a few modern shops. The city of Brescia tends not to attract many tourists compared with nearby Bergamo or Verona, partly because of the counter-attraction of the lakes. Yet it has plenty of history, going back to Roman times, and many points of interest, including two cathedrals – the Duomo Vecchio and its neighbour, the Duomo Nuovo – and the attractive Piazza della Loggia, with a Renaissance palace, the Palazzo della Loggia, which is the town’s municipal centre. The Torre dell’Orologio clock tower bears similarities to the one in St Mark’s Square in Venice.